The Dusun is a small eco-resort on a durian orchard. With five fully equipped bungalows, guests can enjoy privacy, the calm songs of birds, and lovely views of the distant Mantin hills and Berembun Forest Reserve. It is the perfect place to spend quiet quality time with loved ones or by yourself. With guest houses on the top of a little hill, they enjoy cooler temperatures at night. Each house has fully equipped kitchens and outdoor barbecues which they light for guests in the evenings. Minangkabau food traditional to Negeri Sembilan is also available. Awanmulan is a sanctuary in the hills of Negeri Sembilan. The house on stilts sit on a hill slope overlooking a lush valley and surrounded by hills of green forests. Awake each morning to the chirping of birds, the rustling of leaves, the rays of light through the trees. Fall asleep each night to the creeking of cikadas and crickets, the cool jungle air, the stars and clouds over moonlit skies. 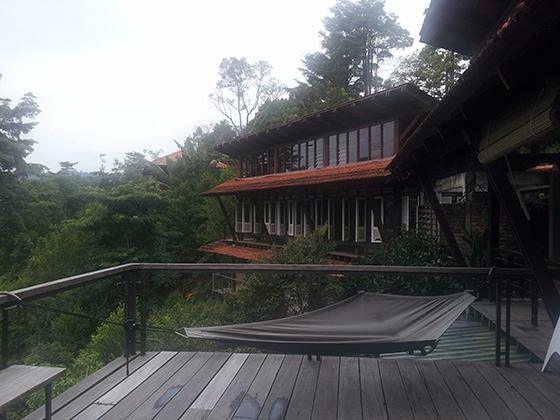 Less than 60 minutes by road or train from Kuala Lumpur, Dusuntara, is probably one of the most well kept secret of a blissfull and heavenly jungle retreat . Majestically sitting at the foothills of the Genting Highlands in the lush tropical foliage of Batang Kali, Dusuntara will not disappoint any visitor. Guests from Australia, Spain, Netherlands, United Kingdom, United States, Japan, Poland, France, India, Singapore and Malaysia, to name a few, have become key influencers and word-of-mouth advocates for the extraordinary experiences and stays they’ve had at Dusuntara. With the Belum-Temengor Rainforest literally at their doorstep, guests at the resort will have a rare opportunity to experience the soothing beauty and mystery of the vast jungle, which has remained untouched for centuries. Nature lovers will revel at the chance to observe the beauty of plants and scenery that can be found only rarely elsewhere. Meanwhile, thrilling outdoor activities await adventure seekers who crave for adrenaline-pumping experiences. Ideally located in Sandakan, one of the second largest cities located on the east coast of Sabah, this area is popular for ecotourism where guests are offered the opportunity to enjoy an ecofriendly environment. A culturally rich city, guests can visit the Labuk Bay Proboscis Monkey Santuary, Turtle Island Park, Kinabatangan River and Gomantong Caves. Don’t forget to visit the Sepilok Orang Uton Rehabilitation Center, indeed the most popular tourist hotspot in the city! Enjoy a refreshing stroll around the resort and guests will be rejuvenated by the fresh and non polluted atmosphere. Apart from being a nature paradise, Sepilok Jungle Resort boasts 45 air conditioned rooms and 15 fan rooms ranging from dormitory to deluxe with balcony. A perfect place for nature lovers, Sepilok Jungle Resort is simply unique. Located in Taman Negara – Pahang’s rainforest sanctuary, Mutiara features air-conditioned accommodation with a terrace, offering Tembeling River or jungle views. It has a restaurant and provides a wide range of adventure activities. Recreational options like jungle trekking, canopy walks, mountain climbing and caving can be arranged at Mutiara Taman Negara’s tour desk. Guests can also visit the homes of the “Orang Asli” or local natives. Fitted with tiled or wooden flooring, most rooms and chalets are made of natural timbre. They offer private bathrooms with hot shower facilities and a hairdryer. Select rooms come with living and dining areas and a kitchenette. Sekeping Serendah is a private retreat attempting to tread lightly on the land. The very transparent and open sheds celebrate the beauty of the natural environment surrounding them. The sheds are intentionally kept basic and free from lavishness. They are seen more as ‘glorified tents’ to provide basic shelter for its inhabitants as they commune with the land. It is located near a sleepy one street town of Serendah, about an hour drive North of Kuala Lumpur. Drive time from Serendah town to the retreat is about 5 minutes, meandering past 2 Orang Asli villagers. Tiger Rock is featured in “1000 Places To See Before You Die”, Newest Edition of New York Times best seller. This hotel has just won 4 awards at the Best of Malaysia 2011 Expatriate Lifestyle Magazine. Tiger Rock is surrounded by jungle and is the perfect place for people seeking a beautiful and tranquil hideaway. The unique and exciting setting of the hotel will blow you away. This hotel offers many types of accommodations ranging from studio rooms to private rental houses. A wide range of recreational activities can be found at and around the property, such as a trip around the island or to nearby islands, trying some local breakfast at Sungei Pinang Kechil, visiting different temple ceremonies, and watching wildlife. For those who simply want to relax, the hotel staff can arrange services to deliver right at the hotel. Those services include traditional massages and henna tattoos. The owning family and their team are very pleasant and active to make your unique vacation a very memorable one. The Shorea is an architect’s family retreat, built within a tropical forest reserve. Its secluded villas are set on natural terrains, with meandering paths leading down to a jungle stream, a waterfall within the Berembun Forest Reserve; it is the ultimate forest getaway. The name ‘Shorea’ is a genus of about 196 species of rainforest trees which include Balau, Chengal, Merangti, Keruing, etc. The resort is constructed by using mainly the shorea timber species which is sourced locally. Most of the resort is also constructed using recycled shorea timber, including main roof beams, timber pillars, staircases, balustrades, and timber bridge. Hello dear, you provide a piece of very good information about 9 Secret forest resorts in Malaysia for a relaxing getaway. Malaysia is a great place to live in, not just for tourists who visit for a week or two, but for retirees and people of all ages as well. It is a place where you can find a combination of big modern cities and natural countryside, a harmonious mix of race, religion, and culture, where multiple languages are spoken, and people are warm and friendly. There are good infrastructure and well-built highways connecting most parts of the Peninsula from north to south. Cities like Langkawi boasts many luxury five star hotels, international airports, and large shopping malls, providing convenient access to all the modern facilities. Recently, I returned from my honeymoon trip from that awesome place & spent my life’s most memorable moment there. Hope you will enjoy there.